Distinctions are not just definitions of words. They are what enables you to see things you couldn’t see before you had them. For example, Alaska natives have many words for “white” because they live in an environment where the clear distinction between shades of white is important. Now unless someone carefully points out to you the different shades you would continue to call all of them “white”. But once you’ve learned the differences your eye can easily discern the various hues. You may even wonder how come you couldn’t see the difference before. Although the value of distinctions is seldom recognized in the professional realm, something very similar happens here. If you’re looking to improve the results you get in any area of your career chances are you would benefit from developing distinctions in that area. For instance, when time after time your ideas are not taken into consideration you may just give up proposing ideas in the future or you may ask what you could do to have your ideas taken seriously. At that time you may learn that the way in which new ideas are presented at your company follows a specific pattern. Which you, being relatively new, didn’t know about. With a simple adjustment you can now present your concepts in a way that they are given the proper consideration and almost overnight, see completely different results. That, in a nutshell, is the value of distinctions. When you didn’t have them you always got the same unsatisfactory results. Once you acquired new distinctions you are able to attain the positive results you were seeking. 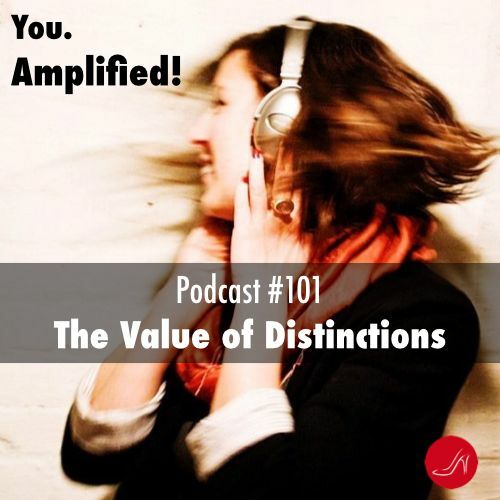 So let’s take a dive into the value of distinctions.